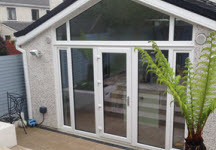 Alpine Sunrooms are proud of our reputation for building quality sunrooms, house extensions and home renovations. We offer you the ability to create the perfect upgrade or addition to your home to meet your individual lifestyle and your budget. Our focus on quality and design delivers practical and beautiful ways to increase your home's living space and usage. Then why not call us today on 01 4583768 - or leave your name and number by using our handy Contact Form - we guarantee you will be happy with what you hear. Is your home meeting your current needs? We are amazed at the difference that the sunroom has added to our living room. Instead of having a room which was never used, we now have a lovely place to sit and relax. They are a hardworking, diligent and extremely knowledgeable team. It was a pleasure to work with Gary and his team. The project was delivered ahead of time and on budget. Work began on the dot at the set date and time, and finished ahead of schedule. Something should also be said about how pleasant Gary has been to our neighbours, who are still praising his attentiveness and kindness.